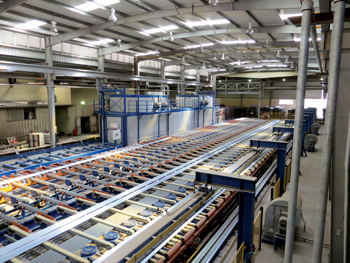 Alupco, the Dammam-based Aluminium Products Company, is expanding its production capacity and diversifying into manufacturing aluminium composite panels (ACPs) after making gains in international andlocal markets. The company is in the process of installing at its Dammam plant a new anodising line, a new casting house and a new press of 12,000 tonnes per year as well as two new Thermal Break production lines. Current annual production capacity there is around 40,000 tonnes with four extrusion presses, two aluminium cast furnaces, one anodising line, two vertical powder coating lines, two wood finish paint lines, one Thermal Break crimpling line, two polishing machines, two protective tape machines and three automatic packing lines. The expansion will be completed by the middle of 2015, said executive sales manager Mohammed Al Enezi who estimated that 30 to 40 per cent of the new output will feed export demand. As well as its Dammam plant, Alupco has a manufacturing facility in Jeddah with capacity of around 45,000 tonnes. In that plant are five extrusion presses, one aluminium cast furnace, one anodising line, one horizontal and two vertical powder coating lines, two polishing machines and three automatic packing lines. 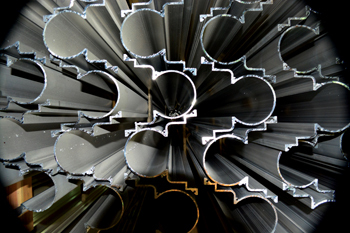 The design and production of aluminium profiles as well as surface treatment with various finishes are as per international standards: EN (European), DIN (German), BS (British) and SASO (Saudi Arabia). 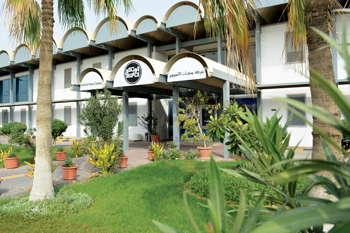 Established in 1975, Alupco has been focusing on quality since its inception and became the first aluminium extrusion company in the Middle East to gain the ISO 9001 certification way back in 1995. “New markets, new types of products and a good share from landmark projects contributed to Alupco’s success in export markets,” said Nasser Al Otaibi, export sales manager. Alupco’s most popular product is the Curtain Wall System which provides structural four-sided, structural two-sided, conventional and semi-structural solutions. “Moreover Alupco is well known for its Saraya Sliding System, 52 System and Thermal Break systems for hinged doors and windows and Pivot systems and Huge Range systems for the commercial and industrial sectors,” Al Enezi said. Al Enezi highlighted Alupco’s special systems as architectural W, D and CW systems such as the 50SG Curtain Wall system and Thermal Break systems for sliding and hinged solutions. Also, Alupco is the sole producer and seller in Saudi Arabia of the ALUK system, which is an Italian system of international standard. Additionally, Alupco features other international architectural systems. 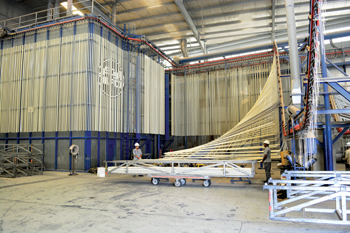 In recent years, the company was involved with Saudi projects including Dammam University where its 50SG and Thermal 123SL systems were used, Princess Noura University in Riyadh (Alu-K), King Khaled University in Abha (50SG), Taiba University in Madinah (50SG and sliding systems), Al Mousa Tower in Riyadh (50SG), Al Arifi Tower in Khobar (Alu-K). Alupco systems were also applied in recent years in kingdom projects including Najran University, Jizzan University, King Faisal University, Al Hassa; Umm Al Qura University, Jeddah; Al Bustan Compound, Riyadh; Al Mousa Tower, Khobar; Noura Tower, Khobar, and Hilton Hotel, Khobar. The company’s profiles have been used in landmark Saudi projects such as Kingdom Tower, Al Faisaliah Tower, NCCI Head Tower and Aqariyyah Shopping Centre-3 (all in Riyadh), King Fahd International Airport, Dammam, and Sabic Office Building and Royal Commission College (both in Jubail) as well as government ministries, banks and hospitals. Away from Saudi Arabia, Alupco’s projects include the Telecommunication Tower and The Central Bank of Kuwait, both in Kuwait; Burj Al Arab Hotel and Jumeirah Beach Residence (both in Dubai); Etihad Towers, Abu Dhabi; Khalifa Stadium and Al Areen, both in Doha, and Beirut Marina Tower and Verdun VII, Beirut, both in Beirut. Alupco has signed up with Eurocon Metal Industries to build a plant in Dammam to produce ACPs. Eurocon Metal Industries, a subsidiary of UAE-based Eurocon Building Industries, is the authorised Alubond USA total solutions provider. Alubond USA is the largest ACP producer in the world bringing out more than 12 million sq m per year. The Alubond metal composite panel consists of two layers of metallic skin made of aluminium, stainless steel, titanium, etc, sandwiching a fire-rated core in a continuous co-extrusion process. “High and growing demand and government plans to use ACPs in some of their projects prompted Alupco to select ACPs for diversification,” said Al Enezi. The official added that the plant will be oriented for Saudi consumption. Alubond ACPs have applications in building facades, ceilings and interiors, solar mirrors, acoustic machine covers, bathrooms, yacht interiors, fire-rated doors, transport and car park grills. “Alubond’s array of colours and finishes combined with the inherent capability of forming different shapes and contours with durability and weather resistance makes Alubond an architect’s dream,” an Alubond statement said. Alubond ACPs have been used in Burj Khalifa and the Address Hotel (both in Dubai) the Formula One track at Yas Island, Abu Dhabi, and Qipco Towers, Qatar, among several other well-known projects.